The hand held RAZ-IR PRO thermal camera is the smallest, lightest, and most versatile infrared camera in its class. The PRO features finger-tip controls, stunning imaging, precise full-screen temperature measurement, and efficient image processing. The RAZ-IR PRO offers versatile performance at the lowest price available, making infrared technology available for everyone. The RAZ-IR PRO® infrared thermography camera is simply the very best RAZ-IR infrared camera available. Not only is it packed with every feature you would ever want or need, you will be surprised at just how affordable it is. 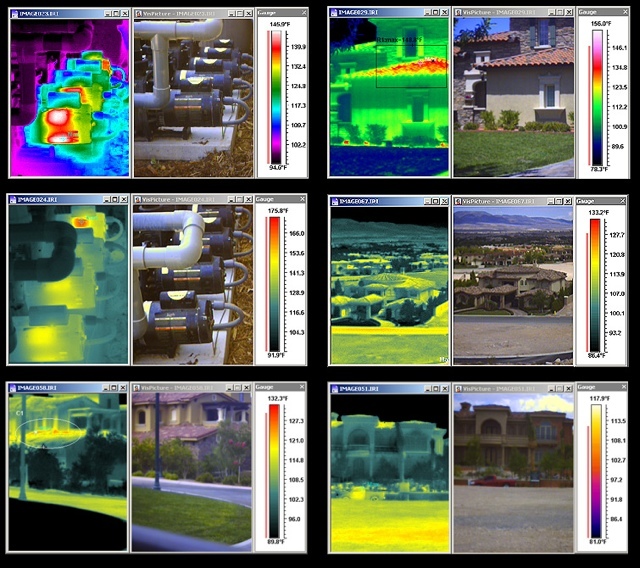 Thermal infrared cameras (also called infrared cameras, thermal imagers, thermography cameras, FLIR cameras, etc.) allow you to visually image heat energy. Any infrared camera can do that, the RAZ-IR PRO infrared thermography camera is light years ahead of basic thermal imaging. Never before have so many advanced features been included on such a small and affordable system. The RAZ-IR PRO gives you real time 60hz TV frame rate thermal imaging, integrated thermal and non thermal imaging, accurate multi-spot temperature measurement, multiple palette color thermal imaging, 8 GB digital image storage with voice comment recording, laser pointer, pro level reporting with fully customizable templates, and thermal analysis software. The RAZ-IR PRO comes fully loaded with all the accessories you will ever need. When you combine all the features and performance of the RAZIR PRO, it is clearly the lowest cost highest performance choice for your thermography needs. The RAZ-IR Pro infrared thermography camera as seen on CSI NY! Unique RAZ-IR cell phone form factor makes the unit comfortable to use in any situation. Complete with an integrated visible red laser pointer to indicate problem areas from a safe distance. At 6″ long and weighing only 10 ounces, the RAZ-IR PRO thermal camera is truly pocket sized. Easily and automatically take visual CCTV images and thermal images for simple and complete reports. The RAZ-IR PRO infrared thermography camera is a ground breaking thermal infrared camera system that puts high end infrared camera features right in your pocket (or toolbox). The unique “flip phone” cell phone style of the RAZ-IR PRO makes it very intuitive to operate right out of the box. Even though the camera is pocket sized, it has all the features of cameras many times its size. You won’t miss a thing with integrated CCTV thermal imager, laser pointer, voice annotation, full screen temperature measurement, 60hz real-time thermal imaging, and a full professional version of reporting analysis software. This makes the RAZ-IR PRO infrared thermography camera the smallest, lightest, full- featured imager available today. Voice annotation lets you record voice comments in the field and attach them to a thermal and visual image. Now you can keep all your notes organized for later report generation. This model is a new addition to the product family. This means you get the most up to date technology, securing your investment for years to come. Accurate radiometric temperature measurement up to 482 degrees lets you accurately quantify the temperature of any pixel in the scene you are viewing. The world wide choice of thermography professionals. Now shipping to destinations around the world. Our export team can assist you with international shipments. The RAZ-IR PRO infrared thermography camera has optional long range telephoto lenses for imaging objects from a distance. The 3x and super long 6x telephoto imaging lenses also let you measure temperature and perform full thermal analysis at great distances. This is perfect for power line surveys and other distant applications. 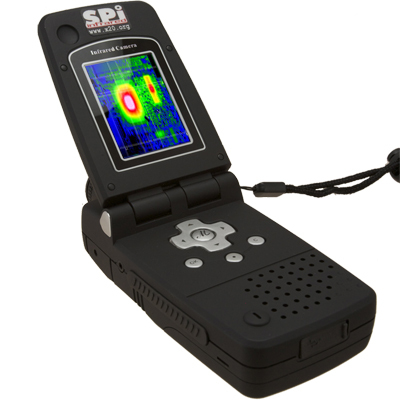 With an eye to the future and a passion for innovation, SPI Infrared brings you the freshest approach to thermal imaging. Building on the traditional capabilities of the RAZ-IR family of infrared cameras, the PRO leaps into the future with innovative features in the most mobile and affordable infrared camera available any where. The RAZ-IR PRO infrared thermography camera shook up the the world of infrared imaging when it was first released. The ground breaking design finally put thermal imaging into a package that was user friendly and simple to carry around with you, anywhere. 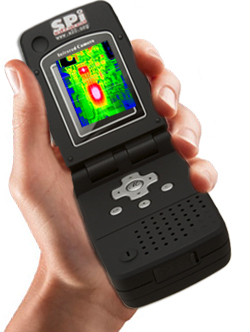 Design modeled after popular “flip phone” style cellular phones, the RAZ-IR infrared camera immediately feels familiar to the user. This comfort factor lets you get to imaging much quicker with intuitive controls and an ergonomic design. A major convenience in the RAZ-IR PRO infrared thermography camera system is the integrated visible laser pointer. The laser lets you indicate problem areas in the image you are scanning. No more reaching out with your fingers possibly into dangerous electrical areas. The laser lets you safely show problems to your customers or support staff. You can easily point out high voltage and out of reach areas safely. WOW! The RAZ-IR PRO infrared thermography camera is about as small as a full featured radiometric infrared camera can get while still being completely usable. The familiar “cell phone” style design makes the camera easily pocket sized while still allowing it to flip open for imaging. The RAZ-IR PRO is just 6″x3″x1″ and only weighs about 10 ounces. This means that you can always have your thermal camera with you, increasing the opportunity for productivity and return on your investment. Smart tools are the ones that are easy to carry and always get used. The RAZ-IR PRO infrared thermography camera is a serious system that comes with all the features of larger and more expensive infrared camera systems. One of the most important features in an infrared camera is an integrated CCTV camera. No more cumbersome separate digital cameras on the job. 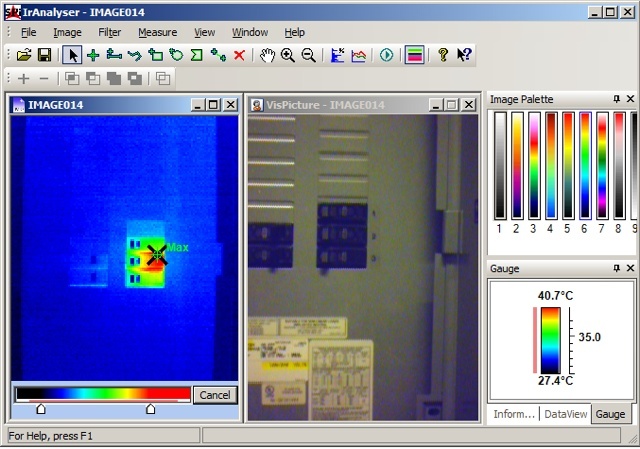 The RAZ-IR PRO automatically takes a thermal and visible image storing them both in a single image file. At report writing time, all you have to do is open a single file. The thermal image, CCTV image, and voice comment will be right there in front of you. The RAZ-IR PRO is a very affordable infrared camera system but that does not mean that it skimps on the important stuff. There is never an additional charge for “professional” software or upgrades. 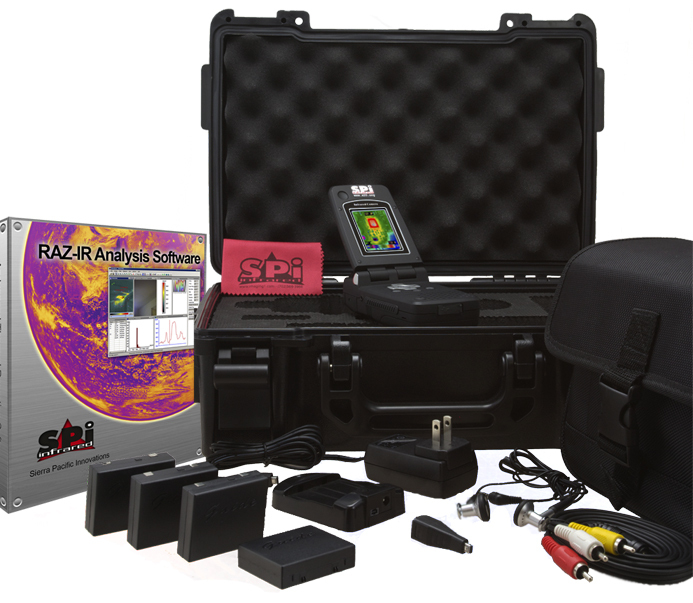 Every RAZ-IR PRO comes complete with fully licensed professional level IR reporting and analysis software. The easy to use RAZ-IR Analyzer software gives you complete control over image processing including temperature measurement, thermal color, area measurement, delta T analysis, and fully customizable reporting templates. The RAZ-IR MAX utilizes radiometric temperature measurement, so in addition to seeing what is hot and cold, it also records the temperature of any particular point in a scene. Simply line up the crosshairs on the spot that you want to analyze, and the MAX does the rest– in real time. Take your measurements and move the crosshairs to your next area of interest. The RAZ-IR MAX allows emissivity, ambient temperature, object distance, and humidity adjustments for temperature calibration and even greater data accuracy. Once a problem area is identified, the push of just one button saves the image. Later, download all saved images into the Analyzer software (included with every MAX camera) and explore a whole world of analysis options. Every pixel within every image is fully calibrated and contains radiometric temperature data. The Analyzer software has complex temperature measurement functions like multiple spot, bounding box, min/max/average, histogram, and delta T that provides content for comprehensive and professional looking thermographic reports. Because the RAZ-IR MAX comes with a standard temperature range up to 482ºF, it is well suited for a variety of industrial settings. Need to measure higher temperatures? No problem, upgrade to the MAX high temperature calibration option to measure up to 662ºF. Now, that’s hot!